Although many people know Mr. Gilberto Mendoza longer than I do, I would like to take the audacity in these lines to introduce him to those who have not had the pleasure to cross words with him, and knowing him personally. When one mentions his name, everyone knows or at least have heard about the President of the World Boxing Association, he is its presentation card. This is a good opportunity to tell you that he has been a successful not only as manager and sports leader, he is an engineer, with great leadership and easy talking that it is a pleasure to listen to him, even when he scolds you in that very discrete way that although you don’t feel bad, you shake or tremble. He is thin, white haired, eye glasses with soft voice, perfect wording, and does not make grimaces or gestures, listening to Mr. Mendoza freshens your ideas. He tells you stories or makes a request with the same lightness he uses when he greets you. He doesn’t pose, that is what I have seen since the first time I met him. In this world and society, posing has become so normal that when you get to meet someone like him, who despite his degrees, managerial and professional position, invigorates the soul. He is turning 71 years old, and still does not take a break in his quest to improve day by day, to make you aware that you have to give the best of you, to a positive influence and to be born conciliator. He is always dressed impeccably, he is loyal and a good friend, he insists that all boxing organizations become allies, he believe in teamwork and his slogan is “do it together”, for the good in general. But not everything in the life of Mr. Mendoza has been studies. He was also an athlete. He told me he played football when he was young boy, and says that he was also good on the sports court in his hometown Barquisimeto, and put on the gloves and fought as amateur. One of his most amusing anecdotes he narrates with a smile on his face is that he was a sparring partner for the professional boxer Ramón Arias, “one a round at the stadium in Barquisimeto, when he was preparing to fight Eder Jofre for the bantamweight title”. Mendoza says “my coach was “Firefighter” Torrealba, friend of Hector Criollo and the sparring coordinator was “Colorao”, who controlled the fever of all amateurs of the time who wanted to help”. He says that he felt very important when he got off of the ring because it had helped the Boxer of the moment. Without having the certainty of the reason why, his life has been marked by gloves, rings, the bell, and hundreds of ideas on how to improve the performance in boxing, his passion sport. He was first member of the Aragua State Boxing Commission, then he made a name internationally, and since 1982 he directs the destiny of the WBA. His greatest accomplishments, it is undoubtedly the creation of the KO Drugs Campaign that spread worldwide. 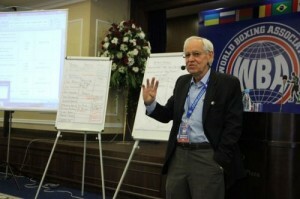 He promoted the regional boxing organizations and the professional growth of the WBA International Officials and medical staff through the yearly seminars. He also has hundreds of merits that make him Outclass in the management field. Besides, I am sure that whoever listens to him closely learns from him more than what he can imagine, receives a dose of enthusiasm and craving to improve, linked to respect to others in order to be better. In sum, we all learn from him, that is why I share his phrase, “Let’s do it right!… Let’s do it together!